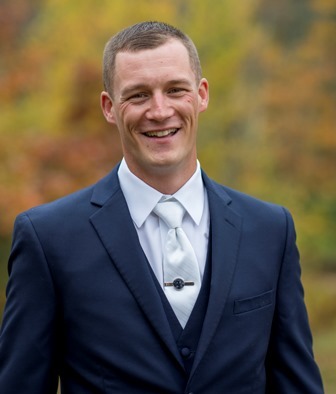 Justin Perry, 28, of Wells, Maine passed away Sunday, April 7, 2019 at his home surrounded by his wife and loving family. Justin was born in Portsmouth, NH on July 12, 1990; son of Scott and Teresa (Stevens) Perry. Justin was a graduate of Wells High School. He worked as a terminal operator at Irving Oil in Portsmouth, NH up until his diagnosis of cancer in February, 2013. Justin adored his family, close friends, and his dog, Camo. He loved hunting on Tatnic Road in Wells and could be found on a lobster or tuna boat in the summer. He enjoyed ice fishing on local ponds and lakes with friends and family. Justin was an adventurous soul and a true outdoorsman with a passion for nature. Justin could never turn down a good deal and was known for wheeling-and-dealing. Justin was pre-deceased by his grandparents, Percy W. & Rita (Stacy) Stevens; grandmother Doris Bailey Owens. great grandmother, Florence Stacy and aunt, Denise (Stevens) Bolz. Justin is survived by his wife Michelle (White) Perry of Wells, Maine whom he married October 21, 2016, his parents Scott and Teresa Perry of Wells, Maine, brother Christopher Perry, sister-in-law, Lillian Jeralds and nephew, Bryer Perry of Ogunquit, ME, paternal grandfather Erwin Perry of Lincoln, ME, father-in-law Mark White, mother-in-law Jacqueline White, sister-in-law Allison White and many aunts, uncles, cousins and friends. Funeral services will be held at the Bethel Christian Church, 129 Lower Main St., North Berwick on April 13, 2019 at 11:00 am. A celebration of Justin's Life will follow from 2pm to 5:30 pm at Spring Hill, 117 Pond Road, South Berwick, ME.